The obverse, or 'head' of the coin, portrays Queen Arsinoe II Philadelphus. (CNN) -- A rare gold coin dating back 2,200 years was discovered by a combined university research team in Israel, a top Israeli antiquities official said Thursday. Dr. Donald T. Ariel, head of the Coin Department of the Israel Antiquities Authority (IAA), said the coin ranked in the top five of the rarest finds in that country's history. "Intrinsically, for coin research, it's a very exciting find," Ariel told CNN. "This is an amazing numismatic find. The coin is beautiful and in excellent preservation. It is the heaviest gold coin with the highest contemporary value of any coin ever found in an excavation in Israel." Ariel said the coin weighs almost one ounce (27.71 grams), while most ancient gold coins weighed about 4.5 grams. It was minted in Alexandria, Egypt, by Ptolemy V and dates to 191 BCE. 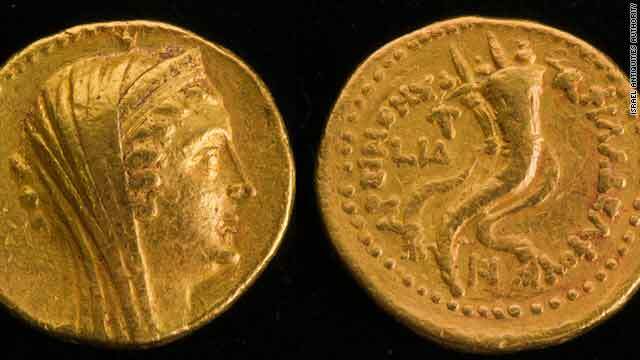 It is only the second gold Ptolemaic coin ever found in Israel. The reverse, or 'tail,' illustrates two "overlapping cornucopias decorated with fillets," according to the IAA. In the parlance of antiquities experts, the coin's denomination is referred to as a "mnaieion," meaning a one-mina coin, and is equivalent to 100 silver drachms, or a mina of silver. The meaning of the word Philadelphus is "brotherly love" and in this context relates to the fact that Queen Arsinoe II Philadelphus was married to her brother, Ptolemy II, who was her second husband. She was first married at age 15 to Lysimachus, king of Thrace, who was one of Alexander the Great's generals. Ariel said it was not uncommon in that period of history for siblings to intermarry. The coin was found by U.S. researchers working for the University of Michigan and the University of Minnesota on June 26. It was embedded in a stone wall "separating the northwest storeroom of the Hellenistic administrative building from a room currently identified as a kitchen," according to Ariel. Ariel speculated it was possible the coin had been secretly hidden and the owner, or the person who possessed the coin at the time, may not have been able to retrieve it for unknown reasons.